This is a sit and machine embroidery class. You bring and work on the embroidery project of your choice. 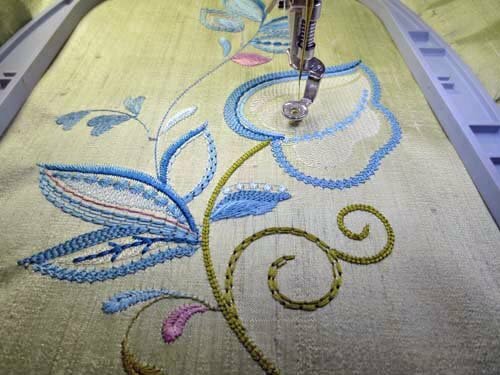 Have you ever said to yourself, "I have this machine, but I don’t know how to use the embroidery? ", "I just can’t seem to get started", or "what is stabilizer?" This class is designed to get you motivated, finish those UFO’s (Un Finished Objects), start something new, or just work while chatting with others. Random techniques will be discussed and shown. Want to learn embroidery machine applique, free standing lace, etc. this is the class. Must own and bring your own embroidery machine and understand basics of how to operate it. Supply List: Embroidery machine, embroidery unit, power cord, embroidery foot, hoops, stabilizers, threads, bobbin thread, applique scissors, straight pins, embroidery tape, frixon pens, seam ripper, etc. This list is generic - your actual supplies will be based on what project you plan to work on. Price is for non-members. Members will receive a $10 discount.